Mr. Ryan Riley began his career with the Pocahontas School District as assistant band director in 2008. He joined the faculty at Smackover High School as Director of Bands and Choral Music in 2012. Mr. Riley then taught as Band Director for Barton Junior High in El Dorado, and then served as Director of Bands for the Parkers Chapel School District from 2014-2017 before joining the Hector faculty. Mr. Riley is very excited about leading the outstanding faculty that have shown such devotion to helping and improving the lives of the children in our community. Mr. Riley received his Bachelor's degree in Instrumental Music Education from Arkansas State University in Jonesboro, AR. He then earned his Master's degree in Educational Theory and Practice in 2010, and then his Specialist in Education with emphasis in Educational Administration in 2016, both from Arkansas State University. 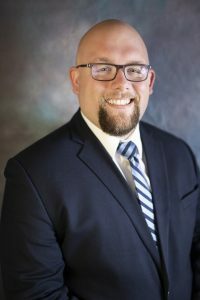 He is a member of the Arkansas Association of Educational Administrators (AAEA) and the Arkansas Association of Secondary School Principals (AASSP). His educational philosophy is a simple one; preparing students for whatever they do after they graduate high school, whether that is college, career, or military. It is his belief that small schools can be just as effective, if not more, than larger schools. While principal at Hector High School, Mr. Riley will work with teachers and staff to provide the absolute best education to every student. Ryan has been married to Kristyn since 2013, and they have a 4 year old son, Jack. Mr. Riley is excited to see what the 2018-2019 school year has in store for the students and staff at Hector. As always....Go Wildcats!